Silvio Berlusconi is an Italian media tycoon and politician who has served as Prime Minister of Italy in four governments. The People of Freedom was a centre-right political party in Italy. Ciociaria is an area of Central Italy roughly corresponding to the province of Frosinone, Lazio, but without a defined border nor historical identity. The name was adopted by a fascist movement of Frosinone as an ethnic denomination for the province of Frosinone, when it was created in 1927. In the Middle Ages, this region was referred to as Campagna. The local dialect, now known as ciociaro, was earlier referred to as campanino. In more recent times, the term Campagna Romana, or Roman Campagna, a favorite subject of countless painters from all over Europe, has referred to the adjoining region to the north of Ciociaria, but part of the Province of Rome. Fiuggi is a comune (municipality) in the province of Frosinone in the region of Lazio in central Italy. The town of Fiuggi became famous for its Acqua di Fiuggi which flows from its natural springs and mountains. The water has been used in Italy since as early as the 14th century and is famous for its natural healing properties. Aerotaxi was a state-owned Cuban charter airline. It had operated basic services within Cuba, as well as some Caribbean charters. The Guardia di Finanza (GdF) (Italian pronunciation: [ˈɡwardja di fiˈnantsa]; is an Italian law enforcement agency under the authority of the Minister of Economy and Finance. It is a militarized police force, forming a part of the Ministry of Economy and Finance, not the Ministry of Defence. Guardia di Finanza is essentially responsible for dealing with financial crime and smuggling; it has also evolved into Italy's primary agency for suppressing the illegal drug trade. It maintains over 600 boats and ships and more than 100 aircraft to serve in its mission of patrolling Italy's territorial waters. National Alliance was a conservative political party in Italy. Licio Gelli was an Italian financier, liaison officer between the Italian government and Nazi Germany, chiefly known for his role in the Banco Ambrosiano scandal. He was revealed in 1981 as being the Venerable Master of the clandestine lodge Propaganda Due (P2). Antonio Di Pietro is an Italian politician and lawyer. He was a minister in government of Romano Prodi, a Senator, and a Member of the European Parliament. He was a prosecutor in the Mani Pulite corruption trials in the early 1990s. Marcello Dell'Utri is a convicted mafia criminal and a former Italian politician and senior advisor to Prime Minister Silvio Berlusconi. Formerly Senator in the Italian Senate for The People of Freedom political party, he was also member of the Italian Parliamentary Delegation to the Council of Europe and of the Italian Parliamentary Delegation to the Western European Union (WEO). He was appointed artistic director of the now closed Teatro Lirico in Milan by the then mayor Letizia Moratti his appointment has been strongly criticized by art critic and then Head of Culture Department of the Municipality of Milan Vittorio Sgarbi. Trials and allegations involving Silvio Berlusconi have been extensive and include abuse of office, defamation, extortion, child sexual abuse, perjury, mafia collusion, false accounting, embezzlement, money laundering, tax fraud, witness tampering, corruption and bribery of police officers, judges and politicians. Vittorio Mangano was a member of the Sicilian Mafia or Cosa Nostra. He was well known as the stable keeper at the villa of Silvio Berlusconi in Arcore in the 1970s and as such Mangano is known as "lo stalliere di Arcore". Berlusconi later became Prime Minister of Italy. The Banda della Magliana is an Italian criminal organization based in Rome founded in 1975. Given by the media, the name refers to the original neighborhood, the Magliana, of some of its members. 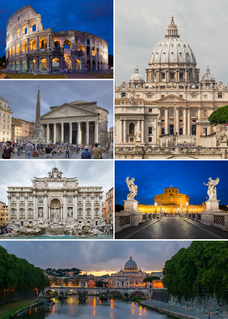 A snap national general election was held in Italy on 27 March 1994 to elect members of the Chamber of Deputies and the Senate. Silvio Berlusconi's centre-right alliance won a large majority in the Chamber, but just missed winning a majority in the Senate. The Italian People's Party, the renamed Christian Democrats, which had dominated Italian politics for almost half a century, was decimated. It took only 29 seats versus 206 for the DC two years earlier-easily the worst defeat a sitting government in Italy has ever suffered, and one of the worst ever suffered by a Western European governing party. Giuseppe Graviano is an Italian mafioso from the Brancaccio quarter in Palermo. He is currently serving several life sentences. Giovanni "Gianni" Alemanno is an Italian politician who from April 2008 until June 2013 was Mayor of Rome for the centre-right People of Freedom. Gaspare Spatuzza, is a Sicilian mafioso from the Brancaccio quarter in Palermo. He was an assassin for the brothers Filippo and Giuseppe Graviano who headed the Mafia family of Brancaccio. After the arrest of the Gravianos in January 1994, he apparently succeeded them as the regent of the Mafia family. He was arrested in 1997 and started to cooperate with the judicial authorities in 2008. In his testimony he claimed that media tycoon and prime minister Silvio Berlusconi made a deal with the Sicilian Mafia in 1993 that put the country "in the hands" of Cosa Nostra. Aldo Brancher is an Italian politician. He served as a minister without portfolio in the Government of Silvio Berlusconi for 17 days in June/July 2010, but was forced to resign due to a pending court case. Denis Verdini is an Italian politician and banker. 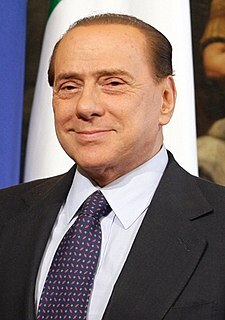 Silvio Berlusconi, a former Prime Minister of Italy, was found not guilty on appeal, formerly accused and convicted of paying 17-year old Moroccan prostitute Karima El Mahroug, also known by the stage name Ruby Rubacuori – for sexual services between February and May 2010 when she was under the age of 18. He was found not guilty on appeal also, formerly convicted of malfeasance in office by arranging to have El Mahroug released from police detention during an incident in which she was briefly held on claims of theft. On 24 June 2013, the Court of First Instance sentenced Berlusconi to seven years in prison, and banned him from public office for life. Berlusconi appealed the sentence, and on 18 July 2014, an appeals court overturned Berlusconi's conviction, thus making him once again eligible to hold elected office. Giuseppe Tatarella was an Italian politician who served as deputy prime minister in the first cabinet of Silvio Berlusconi from 1994 to 1995. 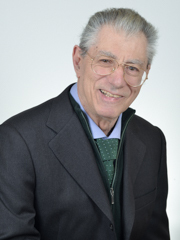 Umberto Bossi is an Italian politician, former leader of the Northern League, a party seeking autonomy or independence for Northern Italy or Padania. He is married to Manuela Marrone and has four sons. ↑ "Fondi editoria, Ciarrapico e altre 11 persone rinviate a giudizio"
↑ "Ciarrapico: veniva al Premio Fiuggi. Nicoletti? Me lo presento' Evangelisti..."
↑ "bancarotta: 4 anni e mezzo a Ciarrapico"
↑ "Sentenza sull' Ambrosiano: " Le pene alleggerite per rieducare i condannati"
↑ "Truffa ai danni dello Stato, indagato l'editore Ciarrapico"